One of five similar DAF SB120 Wrightbus Cadets formerly with Western Greyhound. The unusual prototype TVAC that is to become a car transporter and a 55-plate Plaxton Beaver 2 bodied Vario. 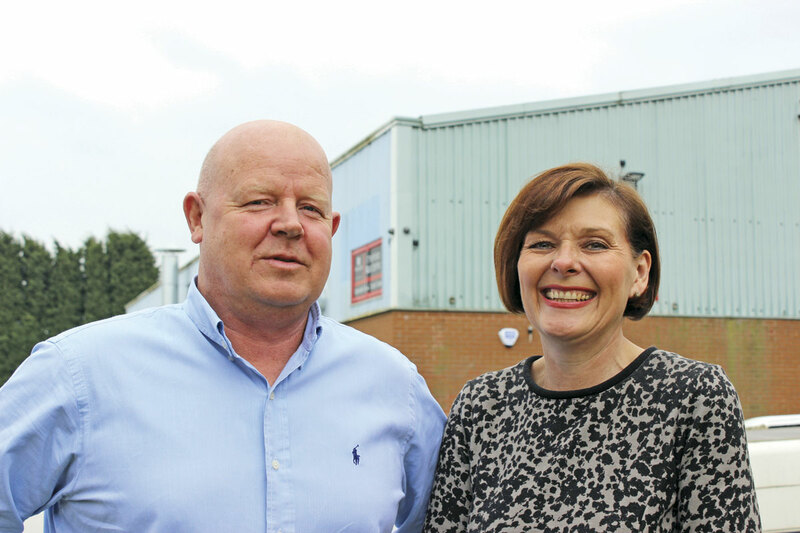 This February saw Martin and Liz Sherratt, proprietors of the Stafford Bus Centre, open for business at new premises of their own. The £500,000 investment realises an ambition they have held since they initially started trading. When they first moved to the rented Cotes Heath site that was their base for the previous 15 years, the intention was always that it would be a temporary stay while they found somewhere they could buy to operate from. Their criteria were clearly defined in that it had to be near enough to where they lived, it had to be in a good area that should not attract vandalism, and it had to be large enough to house a reasonable level of stock. Every time a suitable plot came up, developers would buy it and put half a dozen executive homes on it. After over a decade looking, they had come to the conclusion that what they wanted just wasn’t going to happen. Then, two years ago, they saw an advert for a workshop on the Walton Industrial Estate on Beacon Rise at Stone. It was very well placed within minutes of either Junction 14 or Junction 15 of the M6 Motorway and only four miles from the previous location. 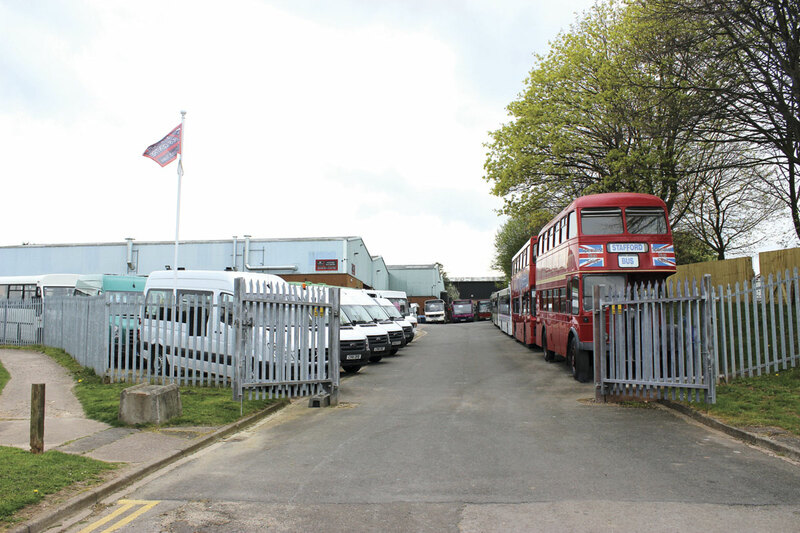 Further research revealed that it was available with one and a half acres of land and, as it had been built for and used round the clock by a storage and distribution firm, it seemed likely that getting change of use for a used bus and coach dealership would not present a problem. They agreed to buy it and anticipated sorting everything out ready to move within a few months. Is it ever that easy? ‘There were change of use issues. It was very convoluted. We’ve had two years of convolution,’ said Martin, ‘We’ve had to jump through hoops.’ Eventually, permission was received and work could begin on getting everything ready. There was a lot to do because the unit is basically half of a larger one and the other half had all of the infrastructure. When they got the keys, all they had was a shell with two toilets in it. There were few utilities and no telephone or internet. Getting everything installed has been a nightmare, especially the telephones. ‘I can’t tell you how bad BT have been. They said they’d compensate us but you never speak to the same person twice,’ said Martin. 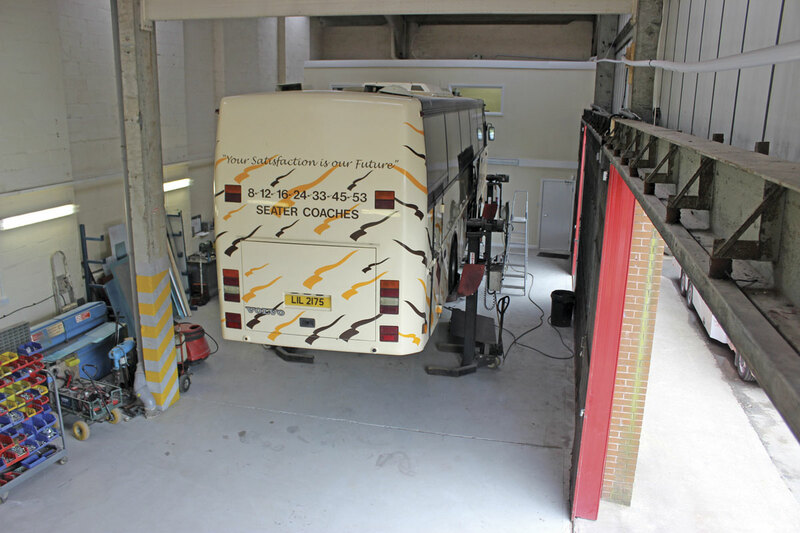 Now the workshop, which will accommodate two vehicles and is fully equipped with ramps and the usual garage equipment, is fully functional. 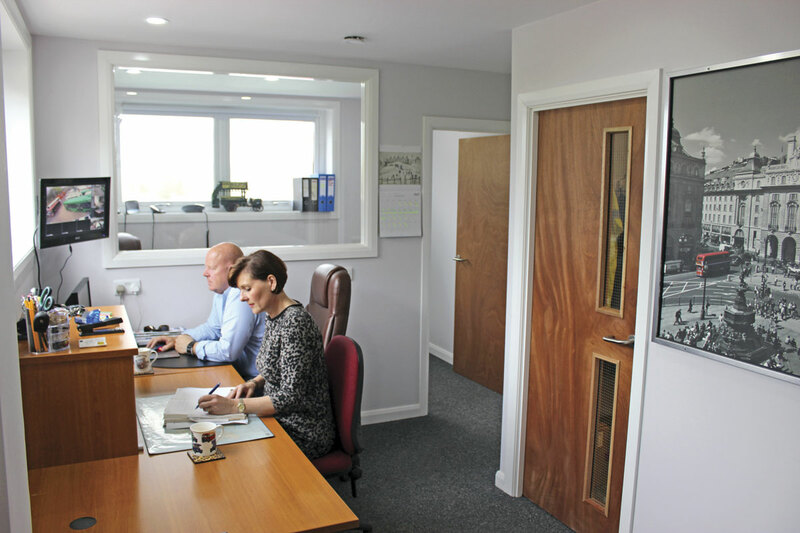 Similarly, barring the addition of a few signs and the installation of a window in the reception area, the office areas are also operational. At the entrance end of the building the premises are on three levels with a reception area for greeting customers, a kitchen and toilets on the ground floor, the main office and hub of the operation on the first floor and a further office, predominantly used for filing and storage, on the third floor. At the other end of the facility, beyond the workshop, are the works mess and more toilets with a parts store on the floor above. A completely new electric supply was installed and the entire site rewired, re-plumbed, insulated and soundproofed. Particular attention was paid to lighting, both outside and in the workshop. All the necessary ducting was installed for the electric gates that are soon to be fitted. There is also a new multi-camera CCTV system monitoring the site. It hasn’t just been a case of preparing the building; when purchased there was no hardstanding and some trees on one side of the site had not been cut back for many years. New fencing has been erected including largely decorative boarding that screens the business from the housing estate alongside, hardstanding for the stock to be parked on has been laid and the trees have been cut back. There are still jobs to be done including the creation of a new wash bay area at the top of the yard, but a huge amount has been achieved and the site is functioning and already presents a very impressive image to visiting customers. Within a few weeks it should be completely as Martin and Liz would like it. ‘We won’t move again, so we want to do it right,’ he said. For the couple it is a huge relief, not only to finally be able to make the move, but to get back to presenting visitors with the kind of reception they like to provide. When the new premises were first found, it was at a time when the five-year lease on part of the old site that included the offices was due for renewal. Not wanting to take this on and anticipating a swift move, the decision was made to temporarily move back into the old portable office building that had once been the reception area for the site. It was redecorated and spruced up but, had they known how long they were going to be in it, they might well have looked for an alternative option. Reducing stocks at the old premises and preparing the new location for a smooth transfer required a degree of de-stocking and a temporary scaling back of business that may have given customers the impression that the company was reducing its commitment to the market; far from it, the temporary lull in activities was a necessary side effect of the need to organise everything at Stone and also rationalise the accumulated clutter built up over years of taking large batches of buses and selling them on from the larger old premises. Stafford Bus Centre isn’t a huge operation, apart from Martin and Liz there are only four other staff; their eldest son, Jason; Anne Marie in accounts; a body man and a mechanic (both fully qualified), so for everything to be done and the business to continue trading something had to give. One big difference between the new premises and the old ones at Cotes Heath is that there is a lot less space to park vehicles than there was. Previously there were around 17 acres at their disposal though rarely were more than 2.5 of them taken up. Martin explained that this is not a problem because the longstanding relationship with the previous landlord remains cordial and the facility to park vehicles on part of the previous site is being maintained, even though the old buildings have been relinquished. It is not the intention that customers will visit the old site in future; any vehicles not already at the new yard will be moved to it if Martin is aware that anyone is coming to view them. With the mix of buses, coaches and minibuses that make up the stock, the new site will accommodate around 30 sales vehicles, all of which can be easily accessed without the need to traipse through mud. As well as the change in the mix, Martin admits that he is probably ‘a bit more discerning’ about the quality and type of vehicles he will buy in than was once the case, partly because operators expectations of cheaper older vehicles that have already covered a lot of miles is less realistic than once it was. It is unfortunate that, increasingly, the buses operators want to buy and the councils want them to operate are not as readily available as they once were because the regulations no longer permit conversions, such as the retrofitting of seatbelts, to be made without a minefield of testing being carried out first, the cost of which renders the task unviable. DDA has also impacted on another aspect of the business, that of renting out older buses. A fleet of around ten Varios used to be kept that could provide an inexpensive source of vehicles for customers to cover short term needs. Unfortunately, more complicated modern buses are not as bullet proof as the old Vario and consequently this side of the business has dwindled to a couple of Solos and Darts that can be lent to ‘people we know’ in their hour of need. An exception is some more recent Ford Transits and Sprinter 16 seaters that are available for rent. Having consciously not bought additional stock in for some months while the relocation was going through, and having only recently restarted the buying process, stocks are not as high as they generally would be, but nevertheless there was quite a variety of vehicles to look at. Most numerous were a batch of 2003 Wright bodied DAF SB120s until recently with Western Greyhound, all six of which had been driven up from Cornwall without a hitch. Double doors don’t suit everyone but at £4,950 with DDA compliance and an Eminox system the five shorter ones looked good value. 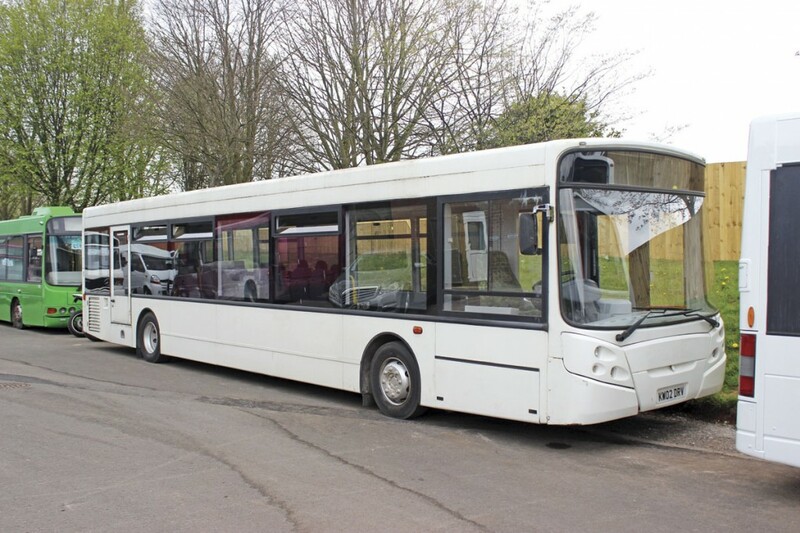 They seated 23 and there was also a longer 30 seater (2004) from the same source at £6,950. Full sized saloons included a very tidy 2001 Scania with Wright body in white. 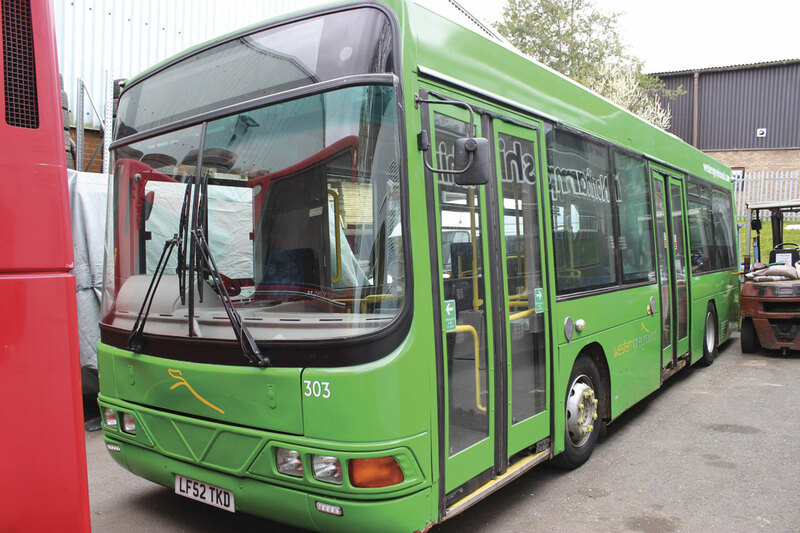 This fully DDA certified bus had 44 belted seats and was offered at £14,950. Another option was an 02-plate ADL Enviro300 saloon that had covered comparatively few miles in its first life as a computer bus. This is to be equipped with 44 seats and completed to DDA specification and was priced at £17,450. There weren’t any low floor double deckers on site but there were a couple of late Volvo Olympians. A Northern Counties example was fitted with an Eminox system whilst an ex Dublin bus with Alexander Belfast body was fully seat belted and very tidy. 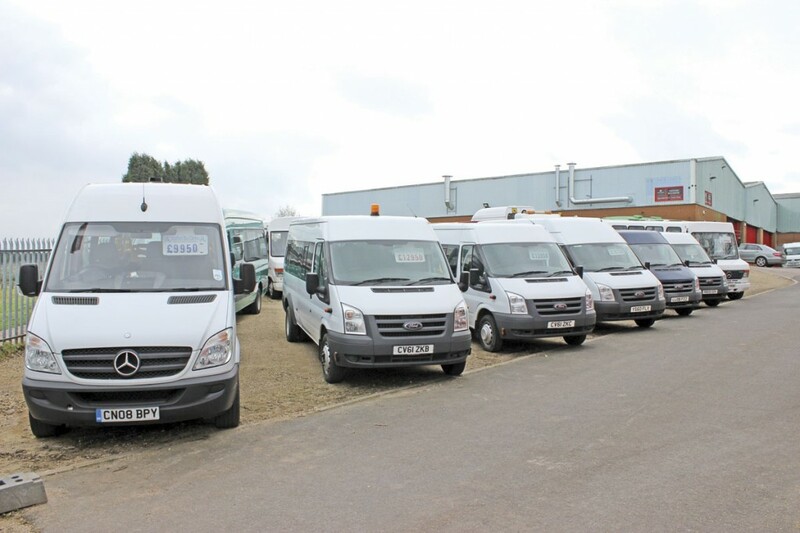 In the minibus sector there was a good choice with a variety of late Ford Transits, a few Mercedes-Benz Sprinters, a selection of Varios of different ages, with various body styles and both with and without lifts, as well as a few others including a 2008 LDV Maxus, a 2007 VW Crafter and a 2013 Renault Trafic. Among the Varios were three NuTrack bodied examples; two 2005 examples with 16 seats a wheelchair lift and space for extra seats and, offered at £30,950, a 2010 PSV certified 0813 with 24 seats. 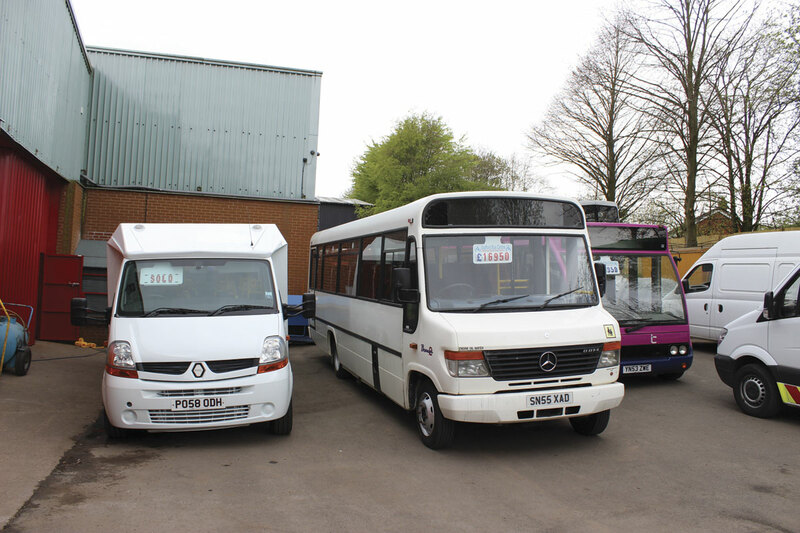 Martin has found that some dealers supplying smaller minibuses for PSV use advertise them as being PSV models but don’t certify them as such until requested to do so by a customer. This can involve a delay before they can be operated. His policy is to ensure any he offers are ready for immediate use, something that customers greatly appreciate. Sold for conversion into a vintage car transporter but still to depart the yard was a very unusual tri-axle minibus produced by TVAC. 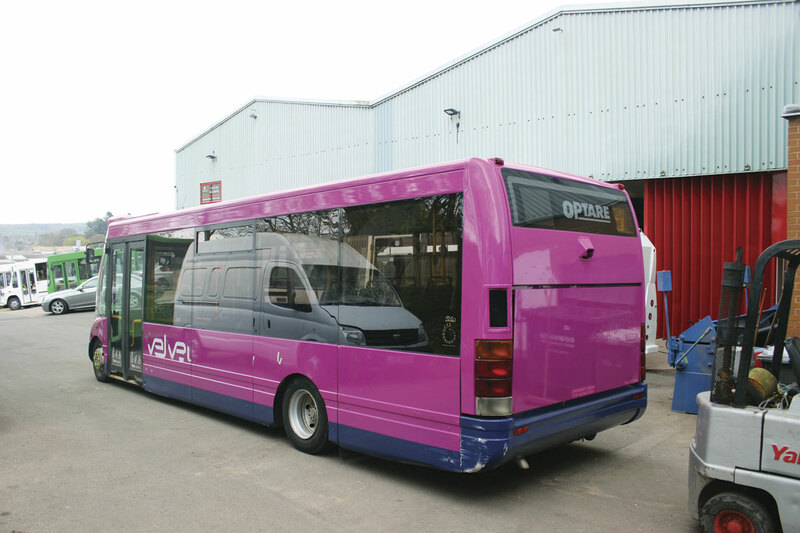 Apparently, this was the prototype for the design and it had only covered 29,000 miles from new despite being a 58-plate bus. A sideline that the team undertakes when other things are quiet is the restoration of older vintage replica vans (based on Ford Transits) and their conversion into luxury trimmed minicoaches. Currently undergoing the process is an Asquith with an Ollerton to follow that. 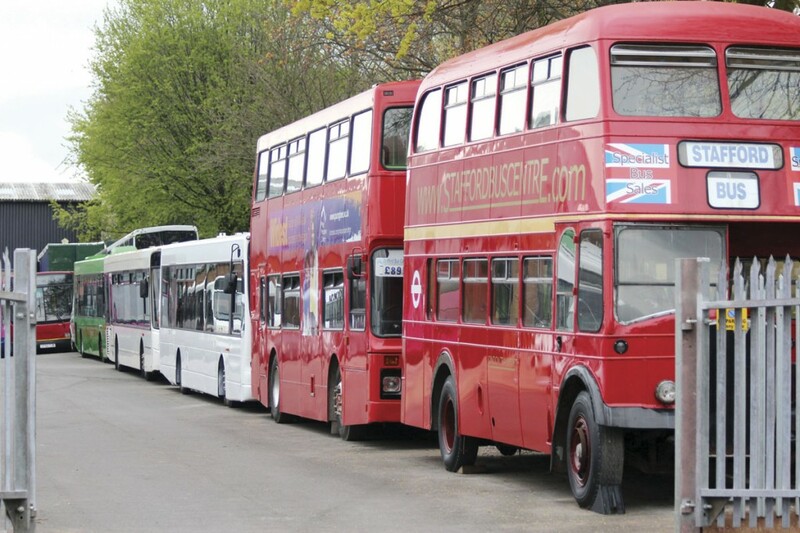 As well as buses for bus use, Stafford Bus sometimes also handles former buses converted for other purposes. Two examples on site were an Olympian converted at great expense and formerly used by a Council as a play bus, and a half cab double deck AEC Regent that would be ideal as a static feature somewhere. The Regent is currently parked at the front of the yard helping to advertise the premises from the road. A new phenomena for the couple is the sight of people arriving at the yard by bus, as First’s service 101 runs past the gate, connecting directly with Stafford and Stoke stations. They are very happy to collect potential customers from the station themselves, but some like to make their own way and now they have an option that wasn’t previously available. 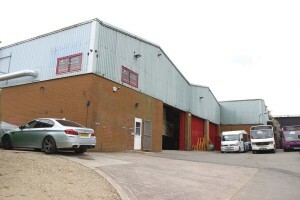 Unit 8a Walton Industrial Estate, Beacon Rise, Stone, Staffordshire ST15 0WJ.